WinDBG is an awesome debugger. It may not have a pretty interface or black background by default, but it still one of the most powerful and stable Windows debuggers out there. 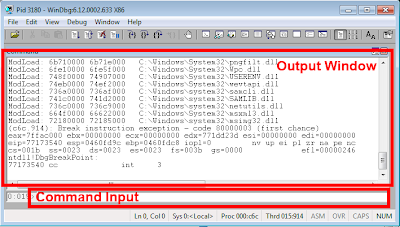 In this article I'll introduce you to the basics of WinDBG to get you off the ground running. In this blog post we'll cover installing and attaching to a process, then in the next blog post we'll go over breakpoints, stepping, and inspecting memory. 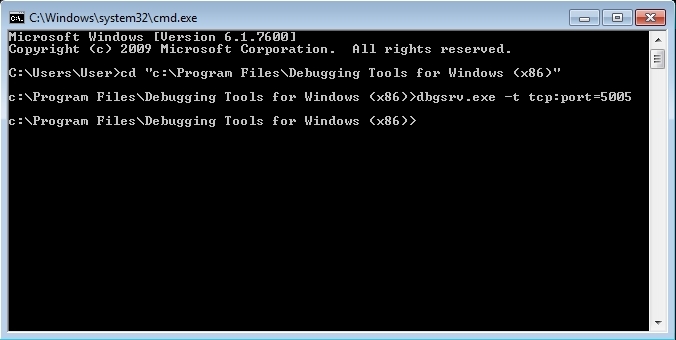 Microsoft has changed things slightly in WinDBG's installation from Windows 7 to Windows 8. In this section we'll walk through the install on both. For Windows 8, Microsoft includes WinDBG in the Windows Driver Kit (WDK) You can install Visual Studio and the WDK or just install the standalone "Debugging Tools for Windows 8.1" package that includes WinDBG. This is basically a thin installer that needs to download WinDBG after you walk through a few screens. 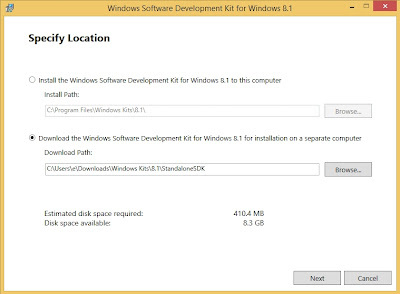 The install will ask you if you'd like to install locally or download the development kit for another computer. The later will be the equivalent of an offline installer, which is my preference so that you can install on other systems easily in the future. 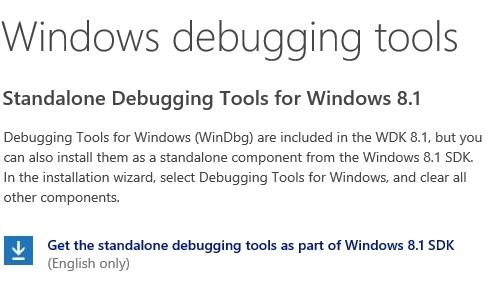 From there just Next your way to the features page and deselect everything but "Debugging Tools for Windows" and click "Download". 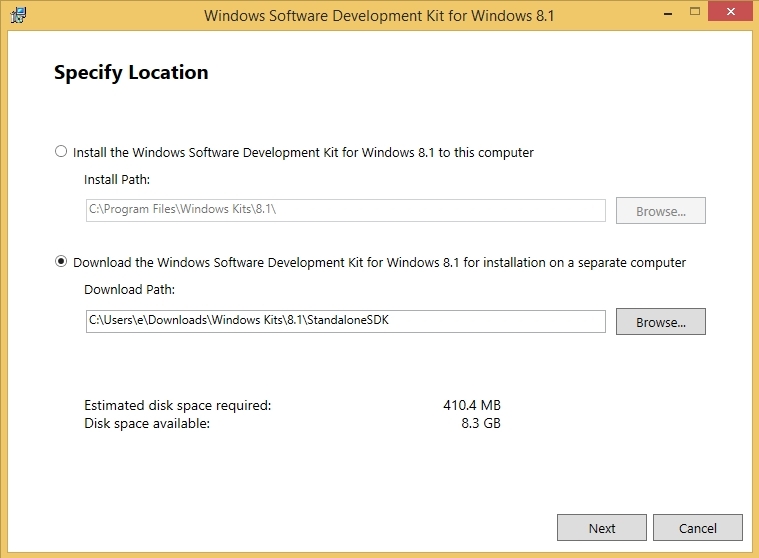 Once the installer completes you can navigate to your download directory, which is c:\Users\Username\Downloads\Windows Kits\8.1\StandaloneSDK by default, and then next through that install. Then you're all ready to go! 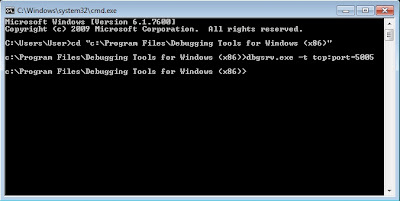 For Windows 7 and below, Microsoft offers WinDBG as part of the "Debugging Tools for Windows" package that is included within the Windows SDK and .Net Framework. 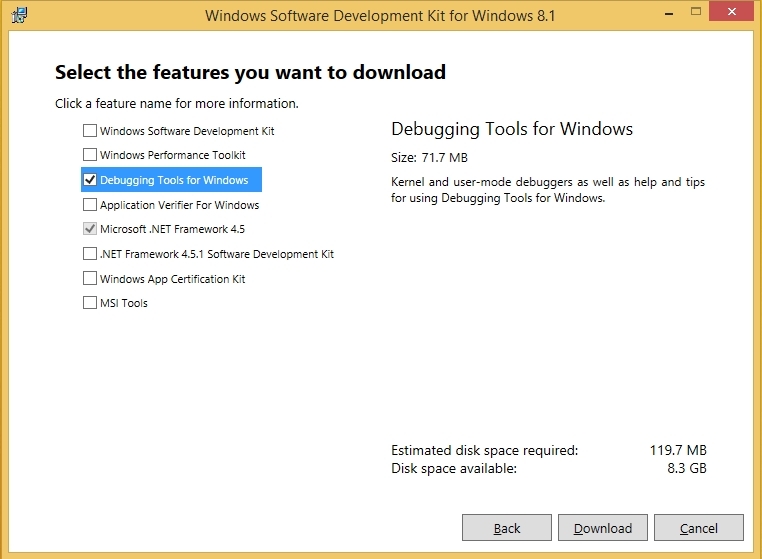 This requires you to download the online/offline installer, then specifically choose the "Debugging Tools for Windows" install option. 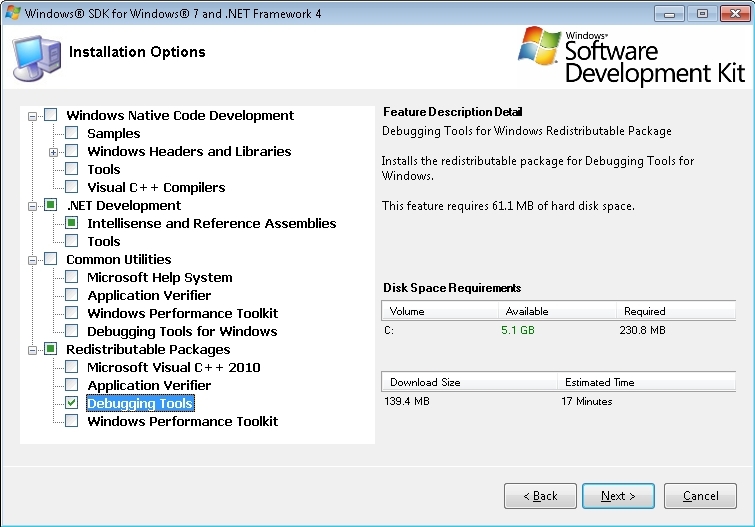 My preference is to check the "Debugging Tools" option under "Redistributable Packages" and create a standalone installer which makes future debugging efforts a heck of lot easier. That's what I'll do here. Once the installation completes, you'll should have the redistributable for various platforms (x86/x64) in the c:\Program Files\Microsoft SDKs\Windows\v7.1\Redist\Debugging Tools for Windows\ directory. From there the installation is pretty simple, just copy the appropriate redistributable to the system you're debugging and then click through the installation. When you run WinDBG for the first time, you'll realize that its intimidatingly simple. 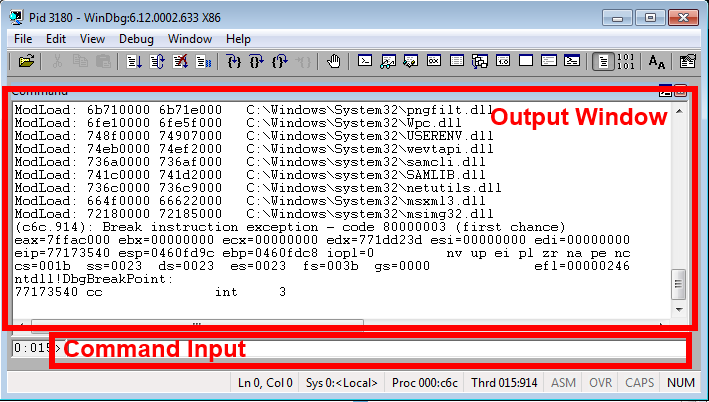 Most of WinDBG's interface is experienced while you're actually debugging a process. So you're not going to do to much with WinDBG until you attach it to a process. Rather then having a section dedicated to the interface (too late!) we'll point out the important parts in the upcoming sections. The most basic thing about the interface you should know is the Command window. It's the default window opened once you're attached to a process. The Command window is mostly an output only window, with a small input field on the bottom which you'll enter commands into to control WinDBG. 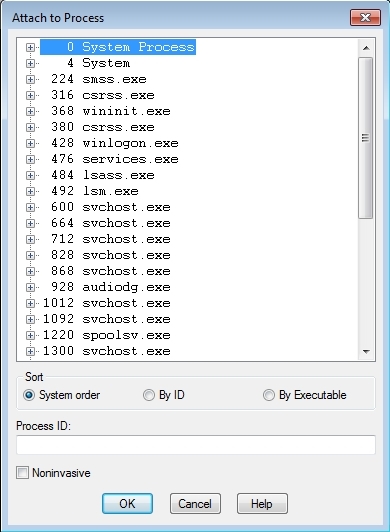 WinDBG doesn't really need much of a configuration, most things work right out of the box. The one important thing to do is set up Symbols. 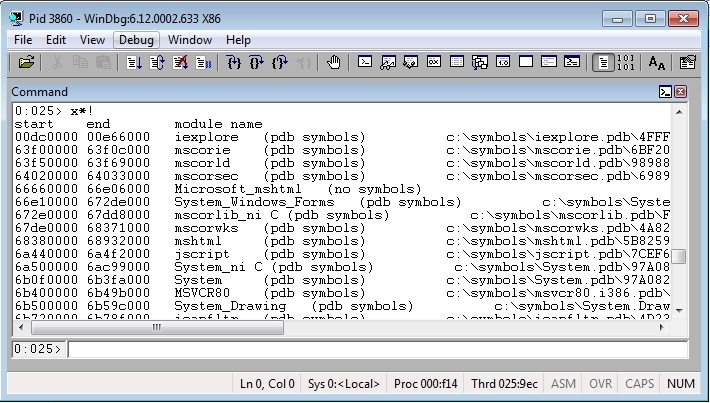 Symbols are basically special files that are generated with the program binary at compile time that provide debugging information such as function and variable names. This can really help demystify a lot of the functionality of an application when debugging or disassembling. 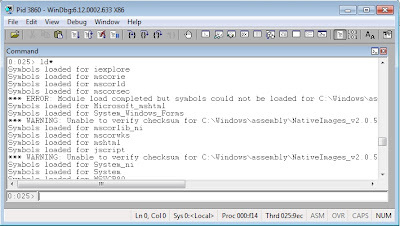 Many Microsoft components are compiled with Symbols which are distributed via the Microsoft Symbol Server. For non-Microsoft binaries, you're usually out of luck - sometimes you'll find them laying around somewhere but mostly all companies keep that stuff protected. 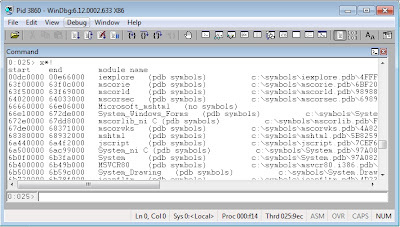 To configure WinDBG to use the Microsoft Symbol server go to File:Symbol File Path and set the path appropriately to the one below. The syntax is a little weird, asterisks are the delimiter, so in the value below, we'll download symbols to the C:\Symbols directory. You have a couple options when debugging a local process. You can start the process then attach to it, or have WinDBG launch the process for you. I'm really sure of all the advantages/disadvantages of each - I know that when you launch a program with WinDBG, it enables some special debugging options (e.g. debug heap) that the program may not like, and it will crash. Additionally, those debugging options alters the code paths in which the programs takes which modifies how things are arranges in memory. 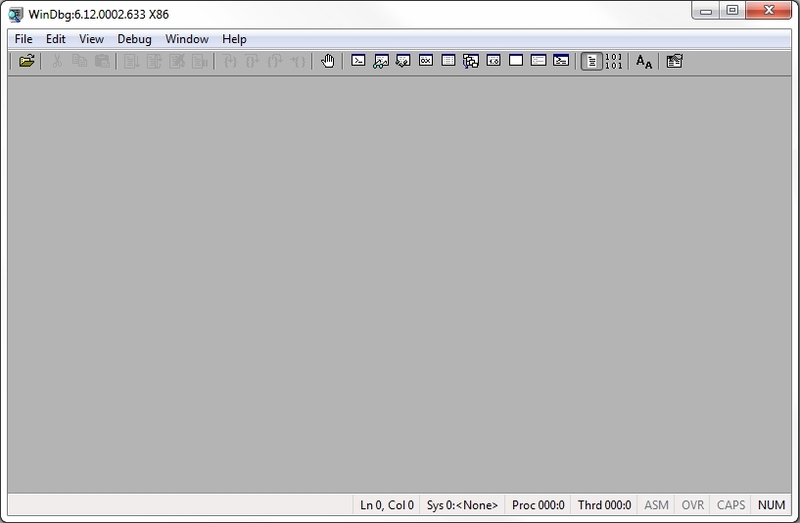 That being said, there are also programs that will crash when you attach the debugger, so ymmv. 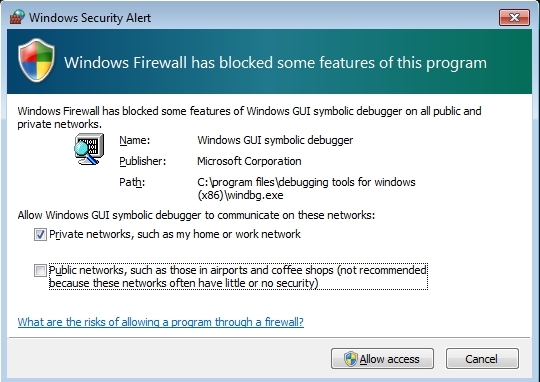 Some applications (malware in particular) will look for the presence of the debugger at launch and may not later on, which would be a reason why you'd attach. And sometimes you're debugging a service that is controlled by Windows which sets up a variety of things during its launch, so to simplify things, you'd attach rather then launch via the debugger. Some people say there is a significant performance impact when launching a process via the debugger. Test it out yourself, and see what works best for you. If you have any particular reasons why you'd do one over the other, please let me know the comments! If you're debugging a self contained application that just runs locally and doesn't communicate via the network, you may want to have WinDBG start the application. However, that's not to say you can't attach to these programs after they've been launched. Attaching to an already running process is just as simple. Note, that in some cases, you'll need to need to spend a little time identifying the true process you're looking to target. 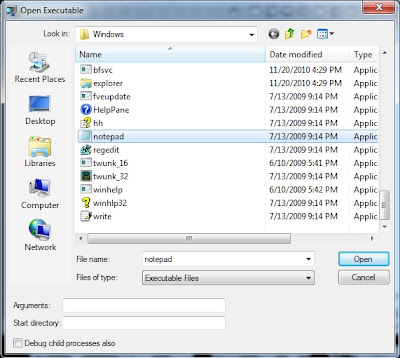 For instance, some web browsers will create one parent process, then an additional process for each tab. So depending on the crash you're debugging, you might want to attach to the tab process rather than the parent. To attach to an already existing process, go to "File:Attach to a Process" then select the PID or process name to attach to. Keep in mind you'll also need the appropriate rights to attach to your target process. 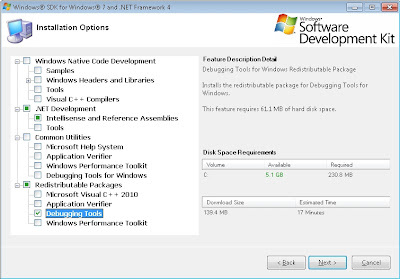 If the program has stopped responding, you can noninvasively by using the "Noninvaise" checkbox. Now there may be times where you have to debug a process on a remote system. 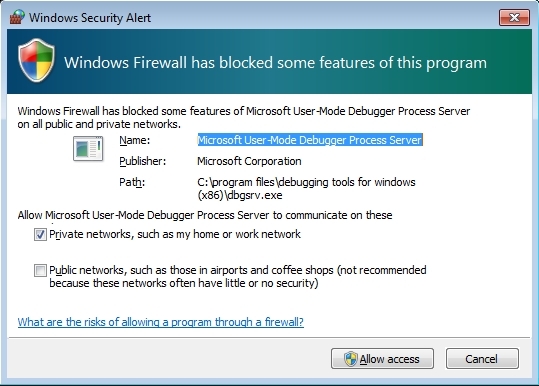 For instance, it may just be more convenient to use a local debugger rather than one within a VM or via RDP. Or perhaps you are debugging LoginUI.exe - which is only available while the system is locked. In these situations you can have a local WinDBG instance running then remotely connect to it. There are a couple ways to do this as well - we'll cover two of the most common ways. 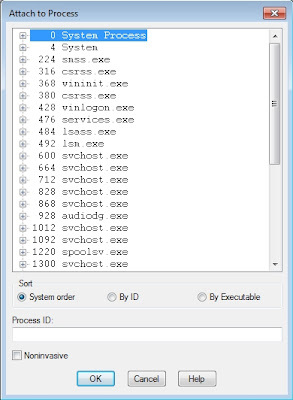 You won't get any obvious indicator that you're connected, but when you go to "File:Attach to a Process", you'll see the process list of the system you're running dbgsrv.exe on. Now you can attach to a process as you normally would as if the process was local. Or just go to "Help:Contents". As program runs it pulls in a number of modules that provide functionality - thus if you're able to gain insight into what modules are imported by the application, it can help identify what the application does and how it may work. 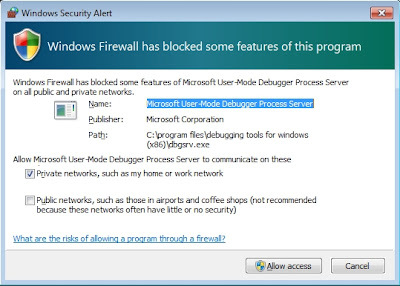 In many scenarios, you'll be debugging a particular module loaded by a program, rather than the program executable itself. To get the image header information you can use the !dh extension (the exclamation mark denotes an extension) on a particular module. This particular message is an exception, specifically a first chance exception. 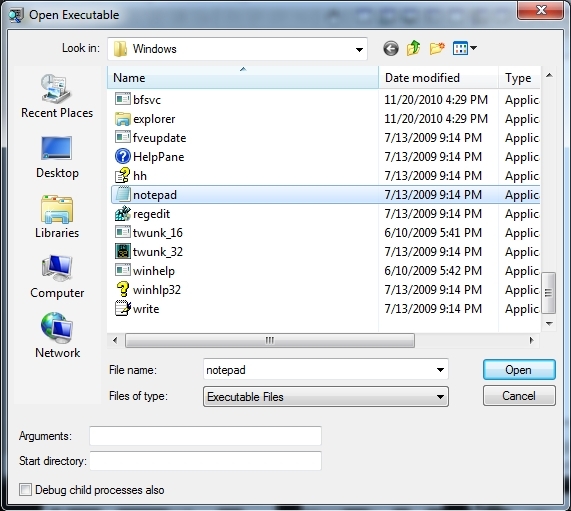 An exception is basically some special condition that occurred during the program's operation. The first chance means that the progam was paused right after the exception occurred. A second chance exception is when an exception has occurred, some programming logic to handle exception was executed, and the program has paused. 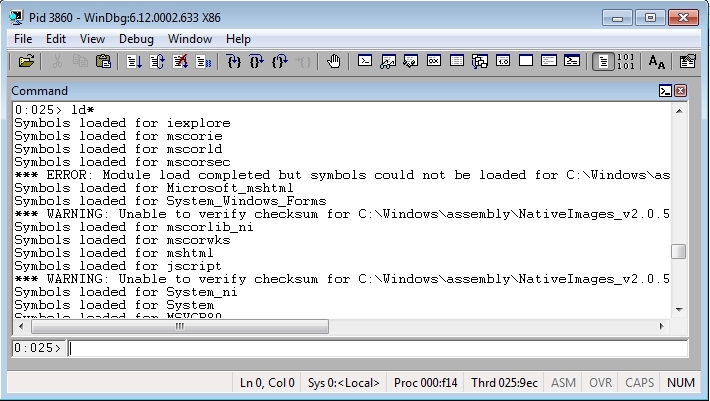 After the messages/exceptions, the debugger will output the state of the CPU's registers. Registers are basically special variables within the CPU that store a small amount of data or keep track of where something is in memory. The CPU can process the data in these registers very quickly, so its faster for the CPU to perform operations on the values in its registers rather then pulling information all the way down the bus from RAM. The final line is instruction to be executed. This is outputted as part of the r command and is what the EIP register contains. EIP is the instruction pointer, which is the register that contains the location of the next instruction for the CPU to execute. WinDBG's output is equivalent of the u eip L1 command that basically tells WinDBG to go to the memory location pointed to by EIP, treat that memory as assembly, and print out one line. In the next blog post we'll cover actually using WinDBG :) - breakpoints, stepping, and looking at memory - stay tuned! Thanks! Love this kind of educational posts!